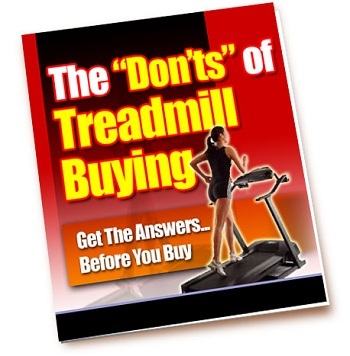 The 'Don'ts' of Treadmill Buying: Get the Answers... Before You Buy! A treadmill would solve that bit of a problem. Or you might be worried about suffering injuries. Running on a treadmill is generally less likely to cause a running injury than running outside. We could go on and on about the merits of buying a treadmill, but when you do get to buying a treadmill, what are the important things that you should remember? A treadmill is a big investment. It might not be a car. It certainly isn’t a house. But you do spend around $1000 of your hard-earned money on a piece of metal that is supposed to help you burn down calories and generally stay healthy. Why would you waste your money on something that doesn’t work, or has very low shelf life? So before you put down your credit card, consider all the factors involved. The first thing you should concern yourself with is budget. But second to that are several more variables and the thing you should and shouldn’t look for in a treadmill. Listed here are some of the “don’ts” you should think about when you buy a treadmill. The treadmill is made of seven components and each one of these is important in their own sphere. However, what really makes a treadmill work as it does is the engine, or its motor, as what it’s more commonly called. When you buy a treadmill, don’t try to save money by buying a cheap treadmill with a weak engine. Not only do you have to avoid weak engines all together, but you have to make sure that the treadmill you choose has the “continuous duty” horsepower, abbreviated as CHP in the specs. A decent treadmill would have a horsepower of around 2.0. Commercial grade treadmills could as much as 5.0 horsepower (HP). One way to find out how much HP you need is to ask yourself how often you’d be using your treadmill. If you are only planning to use it occasionally when running outside is out of the question because of bad weather, then you can probably get away with something less than 2.5 CHP. However, if you plan on putting lots of mileage on your treadmill, or perhaps you’re a heavier runner, then look for something that has more than 2.5 CHP. An average treadmill would have a maximum speed of 10 MPH – that is 6 minutes per mile. If you’re like most people (who run twice every week or some such), that should be enough. However, if you tend to run repeats or you run at a much faster pace than that, then don’t overlook speed when you go treadmill shopping. Obviously, you want a machine that can keep up with your pace, and you can’t have that from a machine that is only capable of 8 MPH or below in terms of speed. If speed is what you want, choose a machine that will move at your pace. That should be the rule. Stay away from machines that can’t even move at 10 MPH, because that’s very telling on how the treadmill was constructed. Hey, we all want to move faster and if the treadmill can’t even keep up with the average speed, then why would you want something like that? One question: Can you keep an even line when you run? I don’t think anyone can. Besides, if that were the case, we’d all be running in treadmills six inches wide. Wouldn’t that be a picture? Just imagine running while focusing on burning calories, while keeping an eye on the timer, while concentrating on staying on the thing…. It’s just not viable. So when you buy a treadmill, make sure that you don’t settle for one with a short and narrow deck. Your treadmill doesn’t even have to be too wide. Remember, you’re placing that thing in your house so unless you bought a treadmill that can be folded (much more expensive! ), then you’d better pick one that is wide enough for you to run effectively, but narrow enough to save space in your home. Of course, the rule always would be “the wider the better,” but pay attention to space anyway. When it comes to length, your choice depends on how steady your pace is, as well as how long your stride is. If you find yourself always slowing down and drifting off the back when you’re almost done with the run, a longer deck would be a wise choice. That way, you’ll have time to catch up before you fall off! The length of the deck also depends on your height. Taller runners tend to have longer strides and, hence, need longer decks. But then again, if your goal is to improve your form, shorter decks are excellent, because they will force you to keep the strike turnover quick and snappy. A treadmill with a deck that is somewhere between 52 inches and 60 inches is the average. Anything shorter than 52 inches would be too short and you’ll find yourself feeling a bit like a hamster on a wheel. A treadmill over 60 inches long would just be impractical. Sure, a treadmill is mainly for running. Why spend an extra Benjamin or so for something so wacky as a drink holder on a treadmill? You have an end table. Use it. But the thing is that while you can make do without all those unnecessary frills in a treadmill (e.g. walkman holder, drink holder, arm rest, etc. ), don’t outright place all other equally “unnecessary” specs out of the picture. Because it might turn out that they aren’t as unnecessary as you think. Take the heart rate monitoring feature, for instance. You don’t need it that much. However, if you really want to fine tune your performance, then you will want to run with a program that measures your heart rate. The same HRM may be used indoors or outdoors. Some treadmills may even display your heart rate on the main display so you can keep a constant eye on it as you run. It’s a minor convenience to be sure, but you will soon find that it isn’t as over-the-top as you believe. So how does it work? It varies from one treadmill model to another. But basically, the treadmill will pickup the signal from your Polar monitor or from a chest strap provided. Other treadmills monitor the heart rate of the runner through their hand grips (not very practical though. Who wants to run while gripping fixed handrails?). Still other treadmills have added a slick new feature in their heart rate monitor by making it so that the belt’s speed adjusts to a predefined heart rate range. Another nifty feature of a treadmill that you should probably consider is programmable workouts. It’s not an absolute must, but if you have a set of favorite hill, interval, or repetition workouts, you can do them now on your treadmill through the programmable workout feature and save them for use on a regular basis. The answer is pretty much obvious. Hey, if you wanted to run on a surface that shakes and shudders, you could always do that…on a skateboard on top of a high-rise building, you screaming like crazy. Jokes aside, you don’t want to run on a treadmill that shakes and shudders with every step. Make sure that the frame of the treadmill is steady and is even supported. It is a widely accepted fact that the heavier a treadmill is, the steadier it will be, and the less likely it will shake and shudder. However, this isn’t always true, so be sure to double check. Look at the footprint and at descriptions as to how the deck is built. If you want a clue to finding out the stability of a treadmill, check out the maximum user weight. That should give some idea on how stable and solid a treadmill is. Generally, treadmills have a maximum incline of between 10 and 15 %. Anything more than that could involve safety issues which you have to check with the manufacturer first. So just to be safe, don’t overdo inclines. Consider what you are running for. If you are running to train, then also consider the course you are training for. If it’s for hilly courses, then you will really need to train on a hilly course. A treadmill with a 10% incline should be able to do the work. It will give you the illusion of pushing your body uphill…an experience that will be somewhat different from an actual run up a hilly path. However, if you’re running a course that has a lot of down hills (like the Boston Marathon, for instance), then a treadmill is not going to be of much help. You can probably try propping the back up with a couple of 2 x 4’s but that would involve another set of safety issues, so again, check with your manufacturer before doing so. Safety is the most important thing to consider, on par with motor, when buying treadmills. This is especially true in households with children. There are two main safety features found in treadmills and so when you buy one, don’t forget to check for these: the safety key and the emergency off button. Some treadmills offer only the safety key. Others offer both the emergency button and the safety key. It is best that you get a treadmill that offers both of these. If not, then weigh down the merits of each feature carefully before buying. A safety key treadmill requires that the key be in place to turn the treadmill on. It usually has a way to attach the key to the runner so that if the runner falls or gets too far away, the key will pull out and stop the treadmill. The emergency off button on the other hand is just a red button that you can push to turn off the treadmill immediately.